I feel like this year we have completely, without a hesitation skipped magical Fall; and all the beautiful red, yellow, greens and brown hues are being replaced by green and red Christmas colors, Wait a second, I want FALL. I love Christmas but I still want a little bit of Fall, like more pumpkin and cinnamon and golden sun rays. Just the other day we were driving to a store. End of the day was coming, through the car window I found myself gazing at sunset in the distance. Warm sunset light caught my eye shining on the valley, embracing the trees, field, houses in such beautiful golden hug. So today instead of posting much requested Christmas post I’m going to share with you utterly delicious recipe for Pumpkin Spice Cut Out Cookies, with real pumpkin puree and yummy spices. To top it off I used Maple Buttercream Frosting. Yes exactly, these cookie are it. They hit home on so many levels. Cookie dough on its own is sticky so be prepared to use a bit of flour when it rolling it out. Cookies are soft and delicious on its own and if you don’t like frosting your job is done here. If however you’d like to frost these I would highly recommend Maple Buttercream Frosting. Sift together flour, salt, spices, set aside. Cream butter with sugar, beat in sour cream, pumpkin puree, beat until well combined and creamy. Add egg whisked with vanilla. beat well. Gradually add flour mix, on low stir it in until combined. Cookie dough will be sticky. Wrap it in a plastic wrap and chill for 4 hours, best overnight. Dough can be made ahead of time, up to 3 days. Stored in the fridge. Preheat oven to 350F. Bake cookies for 9 minutes, depends on the oven but you don’t want to brown on the bottom too much as they won’t stay too soft then. To roll out dough I used Dough EZ rolling mat with rolling guides. I’ve been using it for last 18 months and I love it. As a baker and cookie maker I use it pretty much every day, for different tasks. It stores and cleans up easily too. You can get your own set here, and don’t forget to use promo code : hanielas at check out to get 10% off your order. Domestic and international shipping available. When rolling the dough out make sure to use some flour to prevent sticking, like I mentioned dough is sticky but it’s okay, don’t worry at the end it will all work out. I promise. 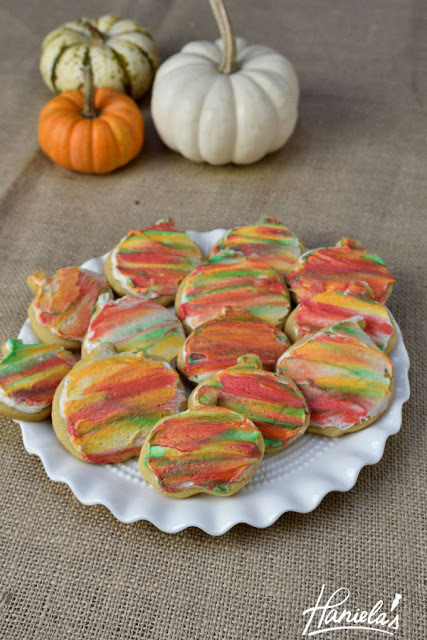 Use cookie cutters to cut out shapes, if needed dip cookie cutter into the flour, shake off excess and then place cut outs onto a baking sheet lined with parchment paper. Bake at 350F for 9 minutes. Remove from the oven, let cool for few minutes on the baking sheet and then transfer to cool completely on the cooling rack. Once cooled, cookie can be stored in the airtight container. Cream butter and sugar until fluffy, gradually beat in maple syrup, add vanilla bean paste and maple flavoring. Decorate as desired or use my fun watercolor frosting technique. See how it’s done in the video. Whisk sugar, maple syrup, melted butter, vanilla, maple flavoring. Gradually add milk. To make the glaze thicker use less milk and visa versa. Both, buttercream frosting and glaze need time to set so once you ice your cookie, let them sit at room temperature for several hour until the surface crusts. Then store the cookies in the airtight container, layered between pieces of wax paper. For detailed step by step instructions and visual help watch the tutorial.